Black can be tricky to use in large amounts in a home. For this reason, it isn’t a common main color choice. But when it’s used, and used well, it can be a striking decorative element. 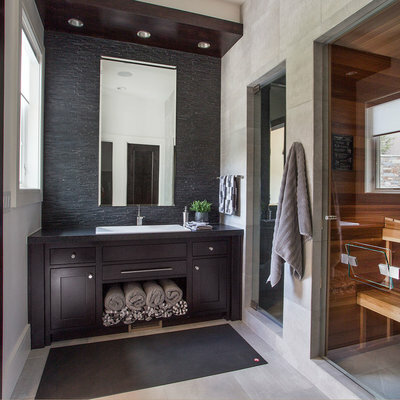 The following examples show how to work with generous doses of black in the bathroom. 1. 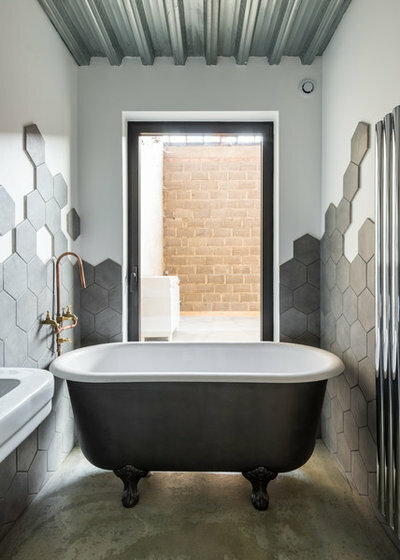 Between the black-painted walls and black floor tiles, this is one dark and handsome bathroom. I think the inclusion of elegant accessories — the large vintage-style clock, the opulent curtains, the charming fireplace and the shimmery chandelier — keeps the space from appearing dull or somber. 2. If the previous bathroom was a tad too dark for you, here’s an example of a lighter approach. With just the upper portion of the wall painted black, and most other surfaces left white, you still get the dash of drama without the darkness. The large window also helps break up the heavy hue. 3. Because black absorbs so much light in a space, it’s important to think of ways to inject brightness. Providing plentiful natural and artificial light is one way to do this, but you can also offset expanses of light-sucking black with texture and sheen. Shiny, textured surfaces will bounce light around a space much more than matte, smooth surfaces. 4. 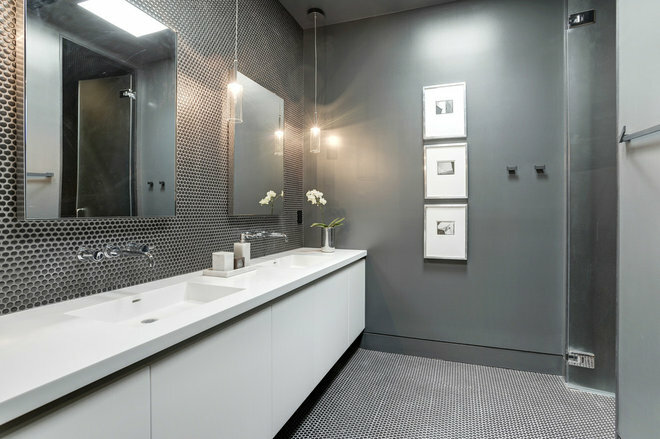 White subway tiles have enjoyed a popular run in bathrooms, and they will likely continue to be seen as a classic choice, but if you’re looking to go a different route, check out your options in black tile. Glossy black tiles in particular will give you a super elegant look. 5. 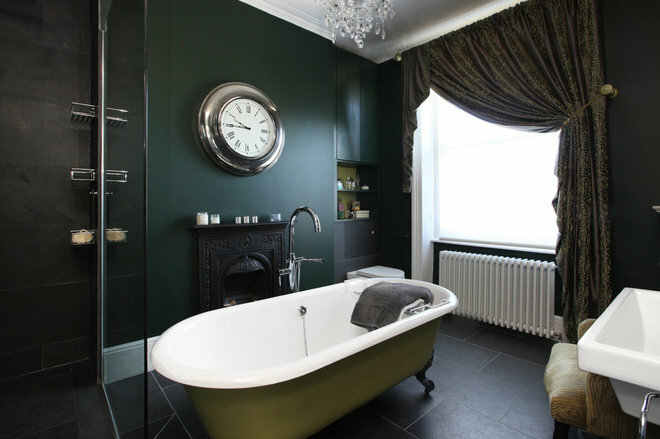 The previous example showed black tile in a contemporary bathroom, but make no mistake, this is one flexible hue. It works equally well in a traditional or transitional space. 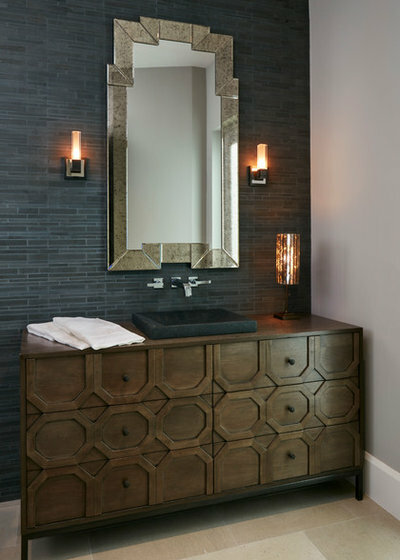 This transitional bathroom has some lovely warm elements that keep the black from feeling too cold. 6. Black and white are classic contrasting colors. Use black, then, to set off interesting materials or details against a background of white. 7. Penny round tiles are among my favorites for a bathroom, especially on the floor, where the plentiful grout lines offer excellent slip resistance. If you go for black penny rounds, think carefully about what grout color you use. A black grout will look less busy, and the effect will be more of a texture than a pattern. A paler grout color will lighten the overall look, but the pattern will be more evident. 8. 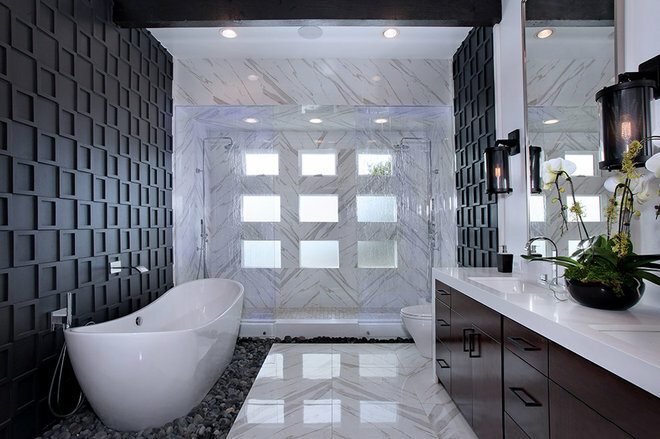 Liking the large accents of black tile but worried about the commitment that comes with them? Consider a black-painted feature wall instead. It’s easy and affordable to change down the road should you fall in love with another hue. 9. 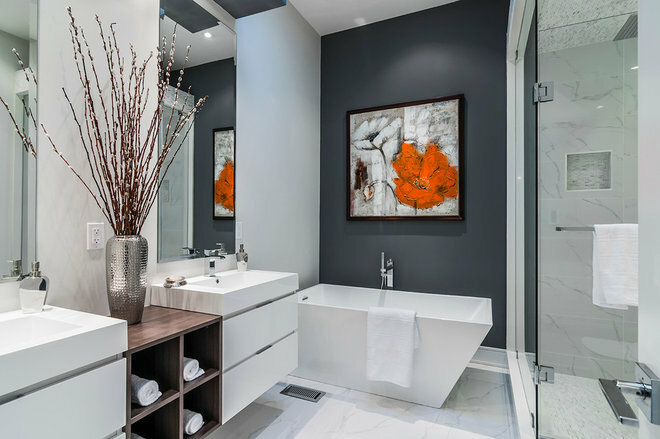 If you’re fortunate enough to have one of these charming claw-foot tubs in your own bathroom, consider punching it up with an eye-catching color. Black is a great choice in this monochromatic room. I like how the restrained palette helps keep the focus on the interesting tile and fixtures in the space. 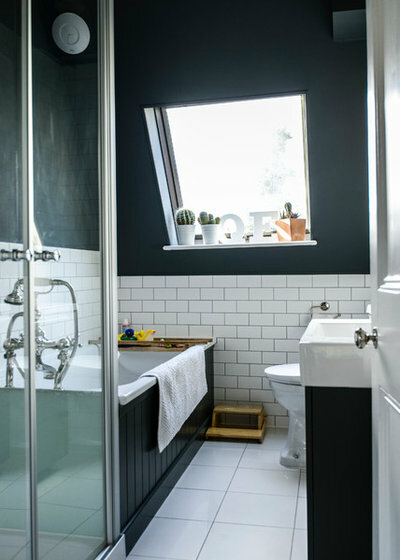 Your turn: Would you dare to use black in your bathroom?